Quentin Tarantino’s “The Hateful Eight” opens with a lengthy musical overture, featuring the static image of a silhouetted stagecoach and a brand new Ennio Morricone score. Minutes later, we’re treated to a spectacular wintry landscape captured on 65mm film with the long-deserted Ultra Panasonic 70 lenses, a feat announced in the credits, alongside the pronouncement of “the 8th film by Quentin Tarantino.” Then comes a full hour of story set within the confines of a stagecoach, and two more inside a cabin — separated by a 12-minute intermission. Welcome back to Planet Quentin, a self-contained universe of cinematic pastiche, outrageous dialogue, cartoonish violence and labyrinthine storytelling that plows ahead while veering off on tangents every which way. These vibrant ingredients have been the touchstones of Tarantino’s oeuvre for nearly 25 years, but “The Hateful Eight” unleashes them in a wild, unvarnished stream of possibilities. This is not a filmmaker whose work tends to show signs of compromise, but the unwieldy excesses of “The Hateful Eight” proves he can get away with anything. While “The Hateful Eight” meanders, it never drags. Tarantino has ostensibly constructed a slow-burn whodunit sped up by the vivacity of his characters. Interlocking agendas collide when a pair of bounty hunters show up at a cabin in the midst of a snowstorm, where their fellow stranded travelers form a suspicious bunch. Everyone’s a suspect, but nobody’s entirely innocent. During the aforementioned first hour, the filmmaker gradually establishes the Wyoming-set world of post-Civil War attitudes, and it’s no surprise to find that they aren’t pretty. As the heavy blizzard coats every inch of the landscape, Major Marquis “The Bounty Hunter” Warren (Samuel L. Jackson) winds up deserted, right in the path of fellow bail agent John “The Hangman” Ruth (Kurt Russell). Scowling from his seat in a stagecoach through his one good eye, this proto-Snake Plissken already has his bounty in tow, noted killer Daisy “The Prisoner” Domergue (a leering Jennifer Jason Leigh). Intent on hauling Daisy to nearby Red Rock where she faces execution, he resists Warren’s request for a lift, but ultimately caves due to the smooth-talker’s innate charms. It doesn’t take long before they’re joined by another straggler, Chris “The Sheriff” Mannix (Walton Goggins), a dapper, wide-eyed figure claiming to be Red Rock’s new sheriff. Tarantino hovers among this trio for some time, mostly so that the two hardened killers can trade barbs while the cheery sheriff cuts through their tension, and Daisy chuckles from the sidelines. Their exchanges range from tales of battlefield exploits to suspicions of unspoken alliances; ironically, though “The Hateful Eight” has been elegantly designed for the big screen by cinematographer Robert Richardson, its first scenes largely unfold in closeups. As the exuberant chapter titles fly by (“One Last Stage to Red Rock,” “Son of a Gun”), Tarantino eschews exposition for the opportunity to luxuriate in these outlandish caricatures. Alternately engaging and one-note, their exchanges hardly amount to more than Tarantino sharpening his weapons of chaos that erupt during the bulk of the movie that follows. Ultimately, the quartet arrive at the isolated cabin Minnie’s Haberdashery, and with the exception of a few perfunctory flashbacks, it’s there that “The Hateful Eight” stays. Inside, the ensemble doubles: The monosyllabic ex-General Sanford “The Confederate” Smithers (Bruce Dern) sits by the fireplace with Oswaldo “The Little Man” Mobray (Roth), who claims to be Red Rock’s new hangman; Bob “The Mexican” (Demian Bichir) mostly sits at the piano, while Joe “The Cow Puncher” Gage (Michael Madsen) lurks in the corner. The hired killers automatically suspect everyone of something, and over the ensuing two hours plenty of malicious schemes arise before the inevitable arrival of bullets and blood, when “The Hateful Eight” tips into sheer sadistic mayhem. In other words, it’s Tarantino’s playground; watching “The Hateful Eight” feels like hanging out with a sensibility. Once the movie settles into its chamber drama mode, the dialogue keeps bubbling up, always on the verge of another tense confrontation. Virtually every energy level gets some representation: Leigh, a screeching villain who spends most of the movie in chains and hurtling epithets at her captors, runs counter to the measured delivery by Jackson’s Bounty Hunter, which unquestionably gives the actor some of his best material since “Pulp Fiction.” Surrounded by bigotry, he triumphs with the most vicious attitude of all. In a playful monologue about revenge, which builds to depraved extremes shortly before the intermission — set to “Silent Night,” of all things — Jackson comes closest to imbuing this wandering story with a fiery soul. Nevertheless, “The Hateful Eight” often gets weighed down by its busy agenda, most noticeably as familiar faces — from Zoe Bell to Channing Tatum — come and go. A random voiceover narration crops up more than two hours in, and certain enticing characters never receive their due. But there’s no doubting the sheer vision on display. Attitudes and trains of thought define the aesthetic. Every scene displays the DNA of a filmmaker who first made waves with a bunch of gangsters chit-chatting about Madonna. 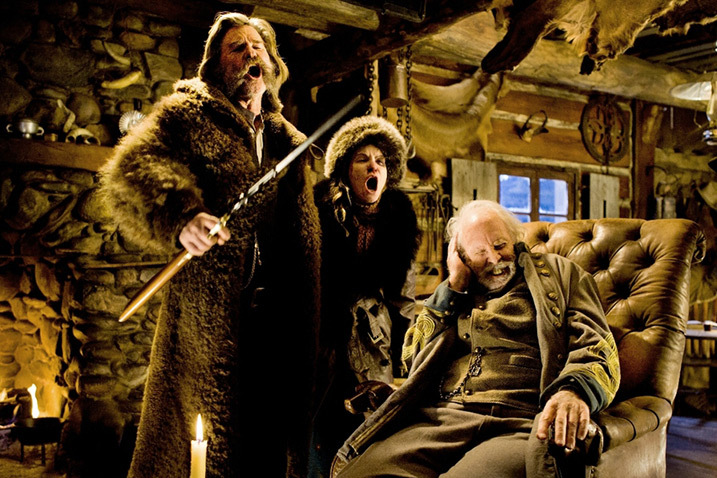 In “The Hateful Eight,” the discursiveness once again looms large. Questions such as “Who poisoned the coffee?” and whether a congratulatory letter wielded by one character was actually written by Abraham Lincoln never distract from the plot; they supplant it. Ultimately, “The Hateful Eight” belongs to Jackson, and the frustrations that the Bounty Hunter has been engineered to portray. When he shouts, “Wake up, white boy!” to one character, he may as well be addressing all of them. Once again, the actor embodies a figure of great vengeance and furious anger, but with grander symbolic ramifications than the hitman in search of redemption he portrayed in “Pulp Fiction.” Here, he’s the catalyst for “The Hateful Eight,” which like “Django” and “Inglorious Basterds,” turns history into fantasy to expose its psychological reverberations. Tarantino’s screenplay, hodgepodge that it is, nevertheless contains endlessly rich observations. “Dispassion is the essence of justice,” one character asserts, essentially condemning the entire cast — and, in the process, society at large. 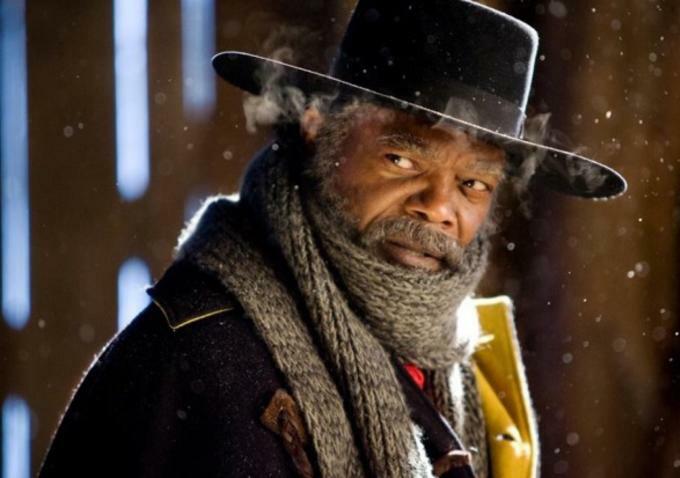 “The Hateful Eight” opens December 25.